Read on for the complete lists of gluten-free potato chips and multigrain chips. Some brands of potato chips contain gluten ingredients and others are subject to gluten cross-contamination in production, we're not quite at the point where it's possible to grab just any bag of potato chips and assume it's gluten-free. Cape Cod potato chips. The company that makes these chips, a subsidiary of Snyder's-Lance, actually is headquartered on Cape Cod and offers factory tours. The chips themselves are marked "gluten-free," which means they meet the U.S. Food and Drug Administration's standard of fewer than 20 parts per million of gluten. Eatsmart Naturals potato chips. Eatsmart Naturals produces one certified gluten-free potato chip — its Garden Veggie Crisps. The brand, owned by Snyder's of Hanover, also makes a variety of other potato chip products that don't contain gluten ingredients, but aren't guaranteed to be gluten-free. Food Should Taste Good chips. Food Should Taste Good holds gluten-free certification for all its chips (including gluten-free tortilla chips and gluten-free multigrain chips in addition to potato chips) through the Gluten-Free Certification Organization (GFCO), which tests to make certain products contain less than 10 parts per million of gluten. Its gluten-free potato chip flavors include sweet potato, barbecue sweet potato, salt and pepper sweet potato, and salt and vinegar sweet potato chips. Food Should Taste Good produces both full-sized bags and snack bags; the latter make great additions to school lunches. Frito-Lay Brand potato chips. Frito-Lay tests its products for gluten, and reports that the products on this list, including many Lays, Ruffles, and Stax potato chip flavors, contain less than 20 parts per million of gluten. Other products, including many flavored chips, contain no gluten ingredients but may be manufactured on the same lines as gluten products, and aren't tested to see if they meet the 20 parts per million gluten standard. Definitely exercise some caution when choosing Frito-Lay chips—while they're readily available almost everywhere, some people who are fairly sensitive to trace gluten have reported getting glutened from them. If you're not especially sensitive, you'll likely do fine with them (and did I mention they're readily available?). Garden of Eatin' potato chips. This brand, a subsidiary of the Hain Celestial Group, marks some—but not all—of its products gluten-free. They should meet the minimum FDA standard of fewer than 20 parts per million of gluten. Be aware that the "gluten-free"-labeled products most likely are produced in the same facility as gluten-containing products, including Garden of Eatin' multi-grain chips, which contain both wheat and barley and are obviously not gluten-free. Before buying Garden of Eatin' products, always check the packaging, both to look for the "gluten-free" symbol and to make sure there are no suspect ingredients listed. Kettle Brand potato chips. All Kettle brand potato chips are certified gluten-free by the GFCO and are processed in a gluten-free environment, according to the company's gluten statement. That includes the company's Kettle Brand baked, reduced fat, organic, and krinkle cut potato chips. Kettle Brand TIAS, meanwhile, don't contain gluten ingredients but are processed in a shared facility and have a risk of cross-contamination. (Avoid Kettle Brand nut butters—they're processed on shared equipment.) You can purchase Kettle's gluten-free potato chips in regular-sized bags and in snack-sized bags, too. I buy these for my family, and I've had good luck finding them in the natural/health food section of my regular supermarket (as opposed to the regular snack/chip section). One Potato Two Potato potato chips. These chips, available in eight flavors, including Hawaiian BBQ and Mexicali Salsa, are certified gluten-free by the GFCO, meaning they contain fewer than 10 parts per million of gluten. One Potato Two Potato chips are sold on Amazon and in some Whole Foods, along with other outlets. POPchips potato chips. POPchips "pops" its potato chips as opposed to baking or frying them, which allows them to contain a lot less oil than regular potato chips. All the company's chips are certified gluten-free. POPchips offers seven flavors, including original, sour cream and onion, barbeque, sea salt and vinegar, sweet potato, parmesan and garlic, and jalapeno. Some of the chips contain dairy ingredients, but none contain soy, according to the company. Terra potato chips. All chips made by Terra (a Hain Celestial company) are marked "gluten-free," indicating they meet the U.S. Food and Drug Administration's less than 20 parts per million of gluten standard. Options include regular potato chips, sweet potato chips, a wide variety of vegetable chips (think taro, parsnip, and yuka), and flavors that range from basic salt and pepper to jalapeno chili. Although I haven't seen any Terra chips that aren't marked gluten-free, make sure any bag you're considering buying contains the "gluten-free" logo on the package. Utz potato chips. Utz brand snack chips maintains a list of products that meet the FDA's gluten-free standard. Check the list before indulging in any particular product, since the gluten status can change. Some people who are particularly sensitive to trace gluten have reported some problems with Utz products. 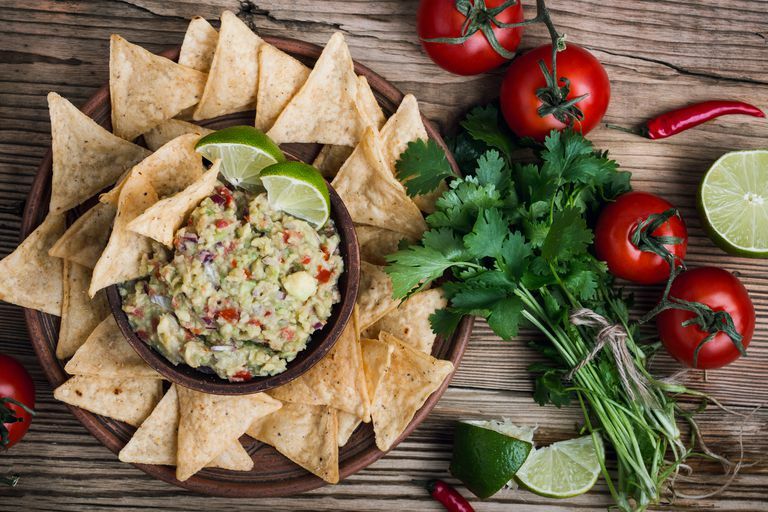 Many people prefer multigrain chips to potato chips because the multigrain snacks provide a bit of healthy fiber along with a crunchier, more substantial chip that holds up better when you dip it in salsa or guacamole. Crunchmaster multigrain crackers. These are billed as crackers, but to me they qualify as chips. Crunchmaster makes them from whole grain brown rice, corn, a four-seed blend with sesame and millet, plus oat fiber (be aware that not everyone who eats gluten-free can handle oats. The crackers come in three flavors: sea salt, roasted vegetable, and white cheddar. Crunchmaster is certified gluten-free by the GFCO, which requires testing to below 10 parts per million of gluten. Eatsmart Naturals Multigrain chips. Eatsmart Naturals, part of Snyder's of Hanover, makes four GFCO-certified gluten-free products, including its Whole Grain Tortilla Chips. The chips include corn, rice flour, sesame seeds, flax seed, chia seeds and quinoa. Food Should Taste Good multigrain tortilla chips. Food Should Taste Good, which is certified gluten-free by the GFCO, makes several different flavors of gluten-free multigrain chips in addition to its gluten-free potato chips and its gluten-free corn tortilla chips. Selections include multigrain, hemp, and white cheddar with flax and sesame seeds. Note that the multigrain chips contain oat fiber, which the company says is gluten-free. These chips aren't always carried by more mainstream supermarkets, but they've become more widely available in the last few years. Late July Organic chips. Small organic and gluten-free manufacturer Late July makes several different multigrain chips, including Sea Salt, Dude Ranch, Sweet Potato and Mild Green Mojo. They're certified gluten-free by GFCO, meaning they contain less than 10 parts per million of gluten (since Late July also makes some gluten-containing products, always double-check to make sure what you're buying from the company is gluten-free). Lundberg Rice Chips. Lundberg, which makes reliably gluten-free rice, also makes gluten-free chips from rice in seven different flavors, including sea salt, barbecue and even sesame and seaweed. The chips all are based on organic brown rice and rice flour; all contain organic corn, and some contain dairy ingredients. Lundberg chips are pretty widely available, especially in health food stores and in the natural food sections of supermarkets. Mediterranean Snack Foods lentil chips. Lentils aren't technically grains, but Mediterranean Snack Foods' baked lentil chips fit well with the rest of these gluten-free multigrain chip products. They contain lentils, garbanzo and adzuki beans, and come in six flavors: cracked pepper, cucumber dill, parmesan garlic, roasted pepper, rosemary and sea salt. According to Mediterranean Snack Foods' gluten statement: "Our tapaz2go, Baked Lentil Chips, Lentil Crackers, and HummuZ crackers are certified gluten free by the Gluten Free Certification Organization. Our Popcorn and Veggie Medley Chips and Veggie Medley Straws contain gluten-free ingredients, but are produced in a facility that also processes wheat ingredients." Michael Season's Black Bean crisps. These chips are made with a combination of beans and grains (in this case, corn and rice). They come in three flavors: Sea Salt, Nacho and Roasted Red Pepper. The company states that all of its snacks, including the black bean crisps, are considered gluten-free. Van's Foods multigrain chips. Van's, which is certified gluten-free by the GFCO (tests to less than 10 parts per million) makes two gluten-free multigrain chips: Mighty Good BBQ and Nacho, Nacho Man! flavors. Both contain oats, so beware if you're also sensitive to oats. The nacho flavor also contains milk ingredients. Way Better multigrain chips. Way Better's multigrain chip options include Sweeet Potato (with chia and quinoa), Multigrain (with corn, quinoa, brown rice, chia, radish and broccoli seeds), and Black Bean (with corn, black beans, flax seed and quinoa). Way Better is certified gluten-free by the GFCO, which means its products contain less than 10 parts per million of gluten. Like other gluten-free multigrain chips, they're not always available in stores, but you can buy them online. While not all chips on your supermarket's shelves are considered safe for someone with celiac disease or non-celiac gluten sensitivity, enough brands now test for gluten that you should be able to find a product you can enjoy pretty easily. If you happen to be particularly sensitive to trace gluten, stick with one of the certified gluten-free brands, such as Food Should Taste Good, Kettle, or One Potato Two Potato. Otherwise, you have a wide variety of brands and flavors from which you can choose.